I’ve seen a lot of things written lately about how one person, regardless of experience or reputation, can’t practically tell another person how to write. While I think that the basic sentiment behind this point of view is true, I think it’s worth noting that there’s a difference between storytelling and writing, in the same sense that a square is a rectangle, but a rectangle isn’t a square. Storytelling can take seemingly innumerable forms, and it is the act of telling a story that I believe people mean to evoke when claiming that subjective advice on how best to approach it is misplaced. After all, I think we have to concede that advice on how best to write a non-fictional, historical biography would be more welcome by most of us than would be advice on how best to write up a world that we’ve created in our heads. If we can agree on this first point, then we can also agree that it is the creative properties of our work which we ultimately feel are beyond the contestation of people with their own subjective opinions on how best to communicate them. What makes one person’s imagination more legitimate than another’s? To put a degree of legitimacy on one’s imagination is an absurd notion, and so most of us (myself included) are reluctant to accept too much creative advice, as well we should be, I think. This, however, does not mean that there isn’t a writer anywhere who can tell us something useful about how to improve our craft. While it’s undeniable that one person’s imagination can’t be considered any “better” than another’s, it’s also undeniable that there are writers out there with different degrees of technical skill. It’s undeniable, in other words, that some writers are simply better at it than others. If we’re being honest with ourselves, we can see that the difference between being able to finish a book and not isn’t always, “well, this just isn’t my cup of tea.” Sometimes, a book is just unreadably bad. We’ve all seen at least one. Once again, if we can accept this, then we can also accept that there is a spectrum along which the quality of a story can fall, and sometimes our own hubris can lead us to mistake sound technical advice for unwanted creative input. This can be a very tough pill to swallow; I know because I recently had to swallow it. An author by the name of Chuck Palahniuk, whose most famous work is probably Fight Club (and whose writing I generally consider to be superior to my own), recently wrote an essay on the merits of “unpacking” terms he called “thought verbs” when writing fiction. You can read it here: http://litreactor.com/essays/chuck-palahniuk/nuts-and-bolts-, along with many other essays on similar subject matter, if you’re interested. In summary, he basically claims that a writer should never use a word that directly describes what’s going on in a character’s head–thoughts should always be shown/implied, and the character, not the author, should be doing the thinking, feeling, loving, and hating. So, expressions like “he felt,” “she wanted,” “they hated,” and “I loved” are out the window. In addition, he states that a character should be left alone as little as possible, because time spent alone can only be used to get inside the character’s head, which is the last place a writer should go (according to Chuck). 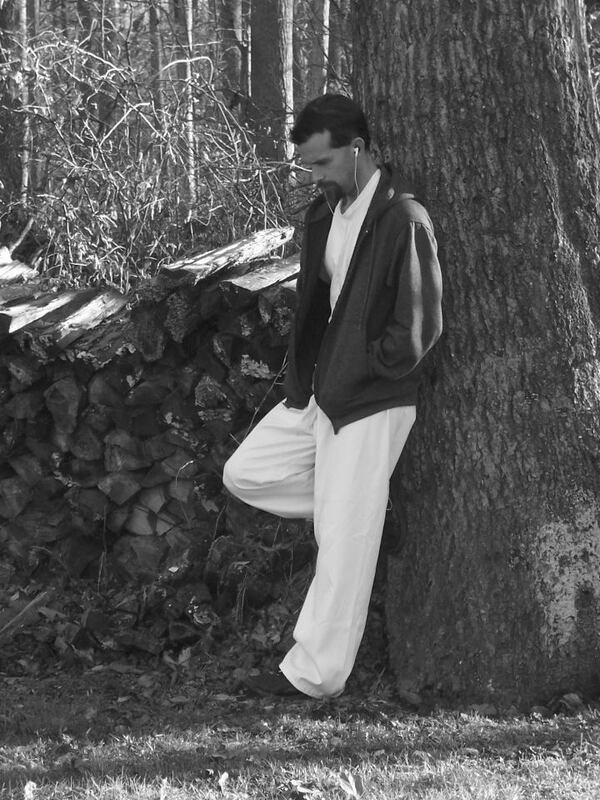 This was a particularly devastating essay to me; I had recently published a novella called “Lornamair,” in which my hero spends a solid 50% of the story alone with his thoughts. Now I was being told by a writer who I respected that it was “lazy,” and my knee-jerk reaction to this was predictable. “Oh yeah, Chuck? Are you saying that never, ever in the history of ever has anyone spent time alone, Chuck? Are you saying that alone time just isn’t a part of reality, Chuck? Well, I’m glad you’re so popular with everyone that you never get left alone! Guess what, Chuck? This is my story! And since I don’t think I’ve suggested anything implausible, it’s staying just like it is!” Seriously, this is a challenging concept to implement. I think we’re all aware that “showing” is a better approach to fiction than “telling,” but what Mr. Palahniuk is suggesting goes further than that. In the time since I read his essay, I’ve tried my best to apply his suggestion, and do you know what I found out? My writing has been better for it. It’s usually true that with each thing we write, we improve, and that is certainly true of myself so far. But sometimes, being receptive to advice like this can forward our thinking in ways we don’t expect, and it can save us a lot of time if we approach it with the right attitude. Now, let me be clear. I don’t mean to suggest that the “rules” that might come with quality technical advice cannot, or should not, be bent. I think we just need to take it for what it is, and not be too proud to try and get better. We, as writers, need to find that balance between recognizing and implementing good ideas while at the same time preserving what it is that makes our work unique. 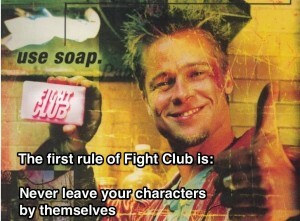 I ultimately decided that the above advice from Mr. Palahniuk, while good and worthwhile to absorb, is not infallible. In the human imagination, anything is possible. This means that you might create a situation in which “thought verbs” are the only possible tool to use. I don’t know how that would happen, exactly, but that’s not the point. The point is that I’m not yet following his advice to the letter, but I’m implementing it wherever I see a reasonable opportunity, and I’ve noticed a clear improvement in my own work because of it. I liken this situation to a wide receiver’s success in the NFL. 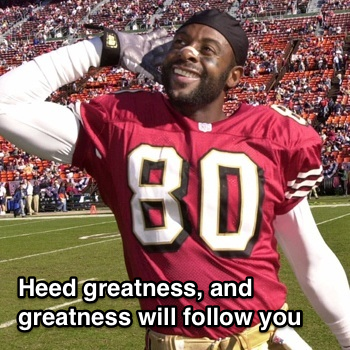 Let’s say you have two rookies playing on the same team as Jerry Rice, the Greatest of All Time. Let’s say both of these rookies, we’ll call them Tommy and Brandon, have a tremendous amount of raw talent. Tommy, however, realizes he’s on a team with the great Jerry Rice, and is eager to learn, while Brandon takes exception to the idea that anyone has anything worth saying to him about how to play the wide receiver position. Let’s be honest, here–which of those two is more likely to succeed? Sure, Jerry can’t teach Brandon’s speed, or his jumping ability, or his size. But the technical stuff? How best to cut in and out of a break in his route? How best to position his hands to secure the ball? How to read a defense and capitalize on a mismatch? If Tommy is listening to that stuff, then Tommy is going to be the better receiver, plain and simple. Often times, the only real difference between success and failure is work, adaptability, and humility, and I personally don’t think that writing is any different. I’d like to point out that this does not mean that Tommy needs to turn himself into Jerry Rice in order to be great, any more than I need to turn myself into Chuck Palahniuk. We can retain what makes us who we are while at the same time recognizing good ideas when we see them. Chuck’s ideas do pose a few problems, after all. For one thing, how are you supposed to write a story in the first person if you’re not allowed to get inside a character’s head? I haven’t yet decided whether or not the use of “thought verbs” is completely avoidable under those conditions, but you can bet it makes writing that story a lot harder, even if it is possible and does make it better. For another, there needs to be some discussion on how important it really is to be “technically perfect” as long as the story you intended to tell gets told, right? As long as you’re technically sound enough to make the story readable, how much of the rest matters at the end of the day? I think that depends some on how much you intend for people to get out of it, but this is a good time to point out that, in my opinion, the mere existence of music is proof enough that technique is secondary to heart in storytelling. Throughout history, there have been incredible songs written (without the use of any words whatsoever) that have told truly epic and emotional stories in their own way. I feel that it goes without saying that sometimes, the emotion behind a story, written or otherwise, is more critical to its creator than the events in it. The fact that it’s possible at all to communicate those emotions without the use of verbal language indicates to me that there is something to be said for working from the heart. If the head wants to have input, all the better, but whether or not technical perfection is necessary is something for each of us, individually, to decide. Speaking for myself, I think I’m happy just as long as I elicit the emotional response from a reader that I’m aiming for. As for the rest, the chips can fall where they may. I know that the overarching point of view that I’ve laid out here is not a popular one, especially among independent authors without any formal training, like myself. However, as with any profession, I maintain that we owe it to ourselves (and our readers) to at least attempt to put in the work that will help us become more proficient at our craft–in our case, more effective communicators of our worlds, feelings, and ideas. I would encourage everyone to find that balance between being receptive to good advice and never letting go of what makes you as a writer, you. It can be easy to get intimidated into thinking that you’re wasting your time because of your technique (or lack thereof), and for those of you who are struggling with confidence, I would encourage you to remember that you are the only person who can tell your story. But it can’t hurt to keep an open mind, either. Writing was the first thing I ever felt that I was good at, and the first thing that I remember ever WANTING to be good at. Ever since I was a pre-schooler, writing “books” on construction paper about my family’s household pets (complete with laughably innocent dialogue), I’ve been striving to find the formula that lets me expressively tell a story that gets people to feel something. very informative and useful advise. i’m still trying to get my first story written, and i am very disappointed with my efforts. having said that i do not want to just give up i want to get better so i am looking for advise like this, useful and simple to understand. i have the same goal to tell a story that gets people to feel something. thank you.